A lesson in how advertising and humanity can coexist. It’s not unusual for brands to chime in about politics, but sometimes the end result falls a bit short (like Pepsi’s recent misstep). 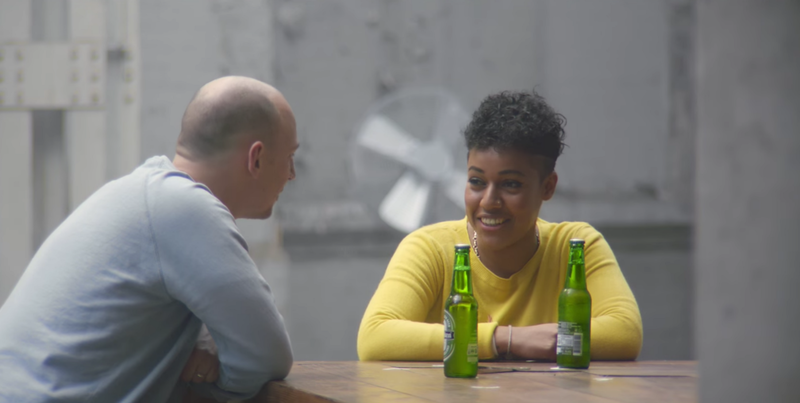 But a new Heineken ad exemplifies how companies can use their platform to powerfully comment (and even change minds) about divisive issues. The spot is half thought-experiment half reflection on how actually hearing each other out can unite people despite their differences. Three pairs of strangers with very different beliefs — including a climate change denier and an environmental activist — work together to build a bar. Later in the ad, the pairs watch pre-recorded videos where they reveal their true opinions. We see a man watch himself say being “transgender is odd. We’re not set to understand or see things like that” while standing next to his partner, a woman who tells the camera “I am a daughter, a wife, I am transgender.” After the videos, the pairs are given a choice: They can walk away or stay and discuss their differences over — you guessed it — a Heineken beer. All of the pairs chose to stay and discuss, and while the ad doesn’t get to the heart of these weighty issues in it’s four-minute run time, it does explore some important ideas. It underscores how when you get to know someone as a person, as opposed to seeing them as an extension of their political beliefs, it’s possible to have productive dialogue and forge actual connections. It also emphasizes our shared humanity, something often lost in the digital age. Writer Joe Berkowitz notes on Fast Company how most political conversations these days happen online, where Twitter trolls are rampant and anonymity makes it nearly impossible to find empathy for those you disagree with. This experiment reminds us that, when we’re able to meet with people face-to-face, it’s possible to respectfully listen and, at the very least, learn something.